Carolyn Louise Jeffries was born on March 1, 1928 in Russell, Iowa to Emil George August and Mabel Carrie (Ewald) Lindeman. She passed away Wednesday, November 28, 2018 at the age of 90 years. Carolyn attended the Russell Community school and graduated from Russell High School, “Class of 1946”. On January 14, 1950, she was united in marriage to William Joseph Duane Jeffries. To this union two daughters were born, Melodee Kay and Nancy Jo. Bill and Carolyn raised their family in Russell, Iowa, where they were co-owners of Bill Jeffries, Inc.
Carolyn was a faithful, life-long member of the Methodist Church in Russell where as a young mother, she enjoyed helping with Bible School and teaching Sunday School. 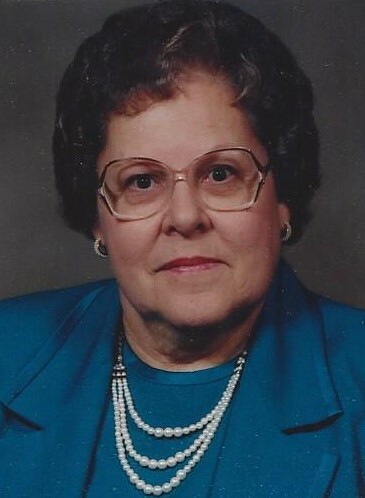 She was also a member of the American Legion Auxiliary for 52 continuous years and a Charter member of the Russell Chapter of Beta Sigma Phi from 1961- 1974. Carolyn’s hobbies consisted of the joy of cooking and having family stop by for a Sunday dinner for a great time together. She also loved to garden, can, and preserve her crops. She loved planting flowers, mowing her lawn, and making her home welcoming. She loved to do crafts and made beautiful keepsake quilts. Her family was always a very important part of her life as she was a very devoted mother, grandmother, and great grandmother. She will be dearly missed by all whose lives she touched. Carolyn was proceded in death by her parents, Emil and Mabel Lindeman; her husband, Bill Jeffries; and her brother, Keith and sister-in-law, Pat Lindeman. She is survived by her children, Melodee (Tony) Irving of Chariton, IA and Nancy (Greg) Throckmorton of Ankeny, IA; grandchildren, Jennifer (Bryan) Cali, Travis Irving, and Emily (Mike) Kluender; great grandchildren, Alexander, Lucas, and Emilia Cali, Gavin, Evan, Aubrey, Sadie, and Elora Kluender; extended family and dear friends. Memorials may be directed to the First United Methodist Church in Russell, Iowa.